Age-related macular degeneration (AMD) is the most common cause of blindness in the developed world. The early stages of AMD do not affect vision but are associated with a high risk of the condition developing into the more severe form of the disease. There are two types of late AMD: they are known as ‘dry’ and ‘wet’. 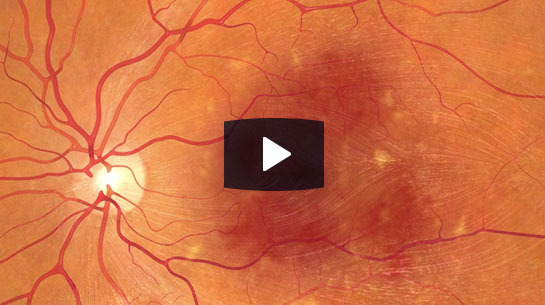 Late AMD is a particularly frustrating disease because it results in a loss of central vision. In other words, someone with late AMD can see everything except what he/she is looking at and is therefore unable to read, watch TV, recognise faces or drive, which dramatically reduces quality of life. An eye doctor detects signs of early AMD by visualising the back of the eye, either with an ophthalmoscope and/or a retinal camera. Spectral domain optical coherence tomography (SD-OCT) allows the layer structure of the retina to be visualised, and this new technology is now crucial to the management of AMD. All of the above technology is available at the Institute of Eye Surgery. AMD is monitored by regular examinations, which include assessment of visual function, SD-OCT and auto-fluorescence. In addition, a new specialised technique known as microperimetry is now available at IoES. Microperimetry allows the eye doctor to monitor patients with AMD by measuring retinal sensitivity changes over time. Retinal sensitivity is known to be reduced in patients with AMD. ‘Wet’ AMD inevitably results in permanent loss of central vision, unless treated. It is diagnosed by photographing the passage of dye in a test known as fluorescein angiography. Wet AMD is treatable in most cases, but only if detected and treated early, when there is a 90% chance of preserving or improving vision. Wet AMD is treated by an injection or by laser, and all of these technologies are available at the Institute of Eye Surgery at Whitfield Clinic. New research has shown that taking appropriate dietary supplements can reduce a patient’s risk of progressing from early AMD to late AMD. Ask your eye care professional at IoES for advice on dietary supplements for AMD. Also, patients can be readily informed of their risk of progressing from early AMD to late AMD and advised on measures to reduce such a risk.